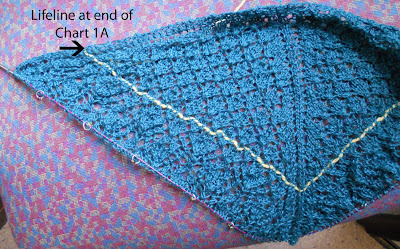 Peacock Feathers Shawl at end of Chart 2. Yellow line is lifeline at the end of Chart 1A. The yarn I'm using is stored on a cone. I like it! It's such tiny yarn (see the single strange coming off the cone?) that I'm sure it would be a horrible mess without the cone. It is disconcerting to knit with what feels like thread, though. I love to read charts. I much prefer charts to written out instructions, but I have never had to reverse direction of decreases while working the chart backwards. It's not too bad, really. I have gotten used to it. To keep myself straight, I printed out the charts (I bought the downloadable version of the pattern) and took them to my Office Supply store to have them laminated. I am using a piece of painter's tape to keep my place on the chart as I knit each row. I used a Sharpie to mark the direction of the symbol for the knit two together decrease -- on the right of the chart for the normal direction and on the left of the chart to remind me as I go backwards. That's saving me lots of grief. 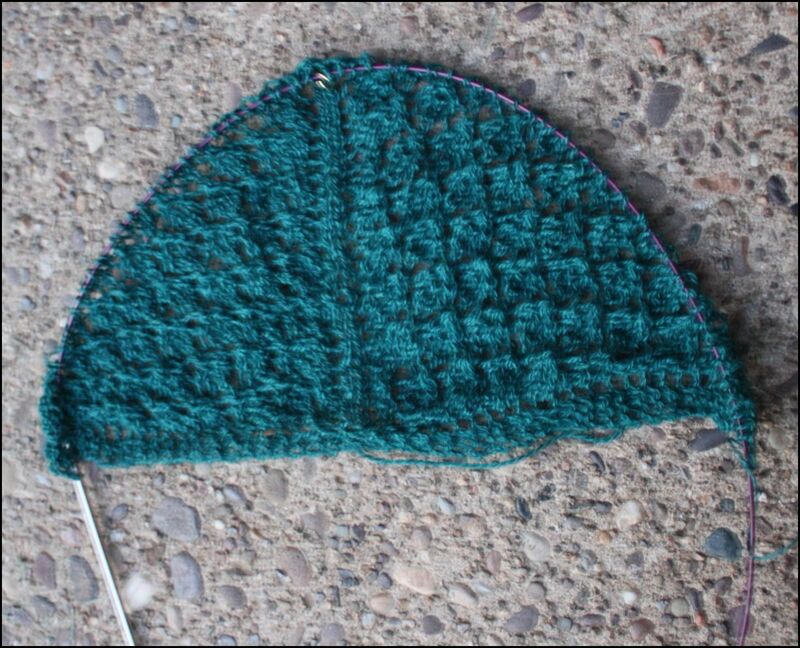 It is also a cool aspect to this pattern -- so far -- that the row number equals the stitch count to the halfway point of the shawl. So row 61 has 61 stitches to the halfway point and then 61 more stitches for the rest of the row. I think of each row in two halves, so it makes counting my stitches for accuracy easy. And believe me, I count stitches at the end of each row -- also made simple by the use of stitch markers. It's not an easy knit, but the designer has kept it from being frustrating by very excellent instructions and charts. It makes doing something difficult a fun challenge rather than an impossible task. Moving along on the Peacock Feathers Shawl -- Chart 1 is complete. And, wonder of wonders, the stitch count is correct. Now if I can just convince myself to add a lifeline. Please tell us five things you are doing this Summer. Bonus? One thing you're not doing, but WANT to be doing. Knit the peacock feathers shawl. I have it started -- about 20 rows, but it starts with 3 stitches, so 20 rows is nothing. This monster takes concentration. I'm sure I'll be knitting some scarves. I hope to go to lots of summer movies, and I like to take movie knitting with me. Clean up my stash and get it organized. Read Principles of Knitting, which I just bought for Kindle. Catch up on my Interweave Knits magazines (also on my iPad). I'm still reading the spring one. Knit a red scarf for the Red Scarf Project. I'll combine that with #3. Knit a pair of socks from Knit Sock Love (I think that's it's name). It's a Cookie A book. Visit at least a couple of Local Yarn Stores (which will have to be out of town -- we don't have any here). Wash and block my son's Mitred Square blanket before he goes back to school. So that's 10 - I knew I could do this for knitting! One thing I won't be doing that I would like to be doing? Knitting more!